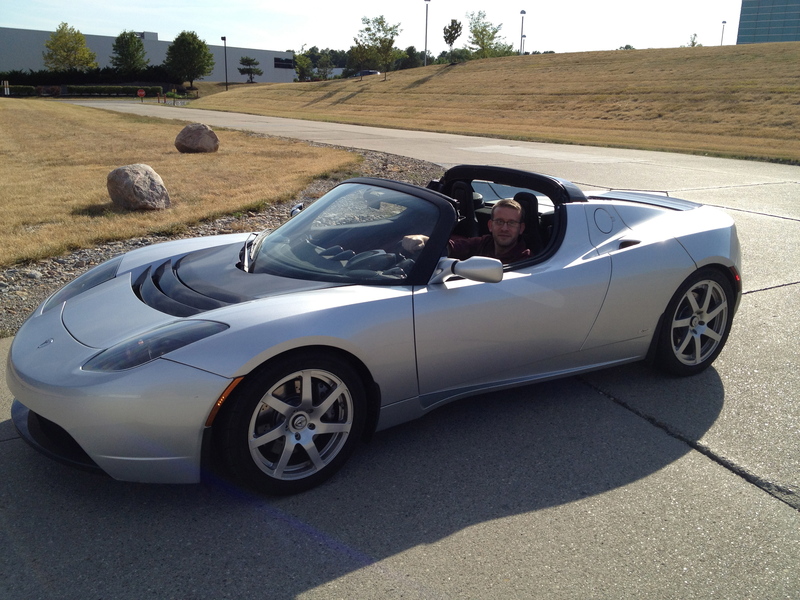 Driving the Tesla Roadster is like being strapped to a rocket. Pure awesomeness. I am in one of the ‘Coolest Toys on Earth’. Who, in their right mind, would turn down an offer for driving a Tesla Roadster? Who would not want to own this all-electric sports car if they could afford it? The answer: everyone I know – especially those EVangelists at Plugin 2012. I unfortunately can’t say the same thing about the Volt, LEAF, Focus Electric, and the handful of other models of electric vehicles out there. You know why – Tesla made a car that was worth something to the higher class folk, which then created desire in everyone else. All the other AutoOEM’s missed the mark, unfortunately, and are fighting an uphill battle – but in the next three years will finally ‘get it’. I have heard and seen Volt and LEAF owners get crazy frustrated with people who ask the simple questions about their cars – how much was it, how much range do you get, can you take it on trips? Then with very little thought, these inquisitive people say something like, “Well I could buy a $23K Prius for that and do everything else that limits you. Why did you buy that?” Talk about an irate EV owner – yikes! Have you ever compared a Porsche 911 to a Prius? Have you ever asked why the owner of a Maserati bought one, and not a simple Dodge Neon (if they still sold them)? The funny thing about electric vehicles is that they drive like sports cars, have all the pep/torque you want to throw at it, are so quiet it is game changing, but no one but Tesla designed and marketed that way. GM, Nissan, Ford, and even Toyota with their EV’s (or PHEV’s or EREV’s or whatever other term they come up) have tried to attack the bread-and-butter family sedan, where all the sales in cars are. They wanted mass adoption of something that cannot be mass adopted without lots of people getting super educated about it. The biggest thing to be educated about is this: batteries are more expensive than a gas engine – there is no getting around that fact. Yes, they are dropping in price dramatically, but when the battery in an EV costs 30-50% of the car itself – that is a big opportunity for figuring out how to ‘get price’ from customers, as business folk sometimes say. Tesla solved this puzzle by designing a sports car that is much harder to be compared to any other vehicle. The Tesla I drove could do 0-60 in 3.7 seconds and takes off faster than the Porsche because of the torque of the electric engine and no transmission. It was exhilarating! The LEAF, though noiseless, was designed to be a family car – which is a utility type car. We, as humans, put value to ‘very nice things’, but the interior styling of a LEAF is nothing super fancy. The Volt’s interior is ‘new-age-like’, but hardly the hand stitched leather found in the ~$130K Tesla Roadster S.
Please do not get me wrong, electric vehicles are not going away any time soon – too much invested in them and the infrastructure. However, what we will see is new models from each of the AutoOEM’s higher-class brands that are electric in some configuration. As long as it is a Nissan I am looking at, and not an Infiniti, I will be comparing it to the Toyota’s, Chryslers, and Fords of the world. New technology has almost always trickled down this way in the business world. EV’s should be no different. The EV marketing mystery. Solved. This entry was posted in Business, Design, Education, Electric Vehicles, Toys and tagged Chevrolet Volt, Electric car, Electric Vehicle, LEAF, Tesla Motors, Tesla Roadster, Toyota, Volt. Bookmark the permalink. Great information.. YOU look pretty awesome in that fine machine. With your new job, you can get one ….. right???? Trish – yes, eventually I would love to get one of these, especially because of the new job … but a house comes first. Thanks for looking out for me. You got to DRIVE a Tesla ROADSTER?!? Almost unbelievable! I thought they were all sold/bought/rented or whatever that fancy thing is they are doing. Leased? Anyway, I can’t think of a better guy to get such a phenomenal opportunity :-). Thanks Shannon – I know, it is almost unbelievable – it was amazingly fast!